The opening scene of Casino Royale finds James Bond in a pea coat, appropriate for a naval officer. The pea coat is a casual coat that’s most appropriately worn over a jumper or cardigan, as Bond wears it here. The length is around the same as a suit coat. Traditionally it’s a bit longer than a suit coat though today’s fashionable pea coat is made shorter. A traditional pea coat is a heavy dark navy blue wool melton, as Bond’s is. It has either six or eight buttons on the front, as well as buttons under the collar so it can button all the way up for extra warmth, though Bond leaves it open. The buttons are horn, rather than the black plastic buttons with anchors typically associated with pea coats. Underneath the coat Bond wears a charcoal ribbed-knit cardigan that can be buttoned up to the collar. The cardigan has five buttons down the front placket, and Bond leaves the top few buttons open. The placket’s buttonholes are reinforced with rectangular knitted pieces. The cardigan has a stand-up collar and patch pockets with a slanted top. There is heavier ribbing on the collar, cuffs, hem and at the top of the pockets. Under the cardigan he wears a dark t-shirt. The trousers are grey wool and the shoes are black calf John Lobb Romsey two-eyelet ankle boots. Awesome coat, and he wears it well here. Cool coat and look. 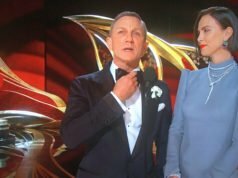 I know this will be controversial, but I really think Casino Royale is sartorially excellent. Throughout the film, Bond wears modern clothes with classic looks that are true to the character and appropriate for the context of the particular scene. Kudos to Linda Hemming. My only quibble is with the kind of out-of-place, 1930s gangster look of the last suit in the last scene (the Quantum suit for that scene was better), and when Bond takes off his dinner jacket during the poker game – one shouldn't and it doesn't photograph well. 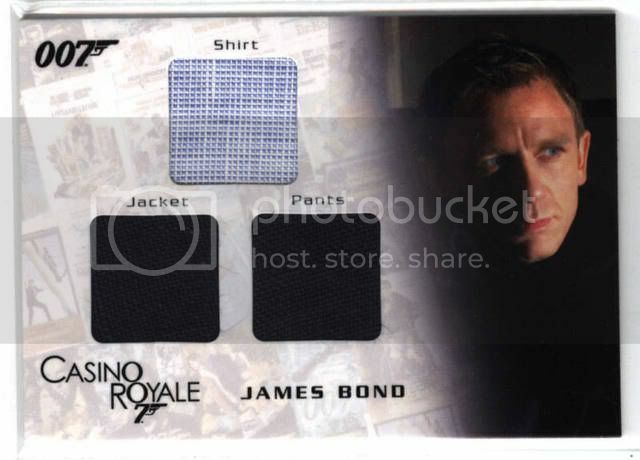 But overall, Casino Royale may have the most varied and well-done Bond-clothes of the series. I think this is excellent. It hearkens back to Bond's military background and a classic peacoat is a timeless piece of casual outerwear. Well done. Great outfit. Very appropriate for sneaking into a corrupt station chief's office and then "decomissioning" him. Something every navy officer would likely have stashed away in their wardrobe after leaving active service. Could this coat be worn with a suit? 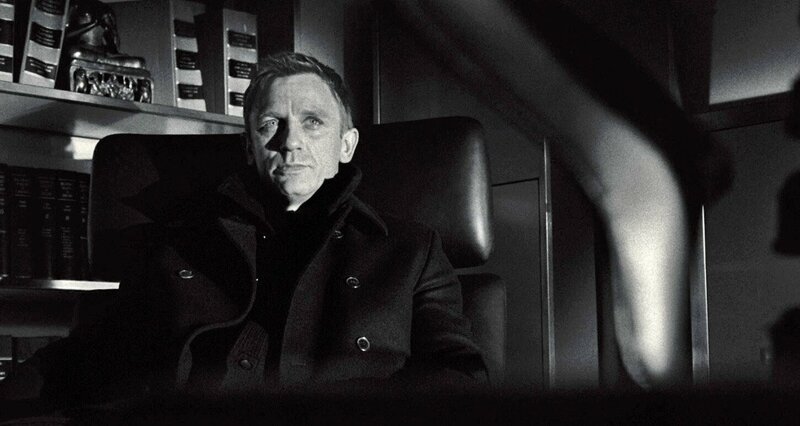 Bond wore a longer version of the pea coat in QoS during the final scene. No, a peacoat is a casual coat and should not be worn with a suit. It's too short also, since at most it may extend 3 inches longer than a suit jacket. 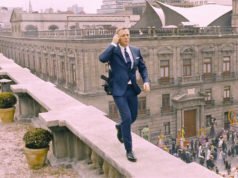 The coat at the end of Quantum of Solace is double-breasted, but that's about all it has in common with a pea coat. Not only is it longer, but it's also more fitted, making it more formal. Pea coats have a straighter cut. Does anyone know the term used to describe the lapels on a pea coat. I own a suit with lapels identical to these. Also, the QoS coat has pea coat lapels. Peacoats don't have lapels, and neither does the coat in Quantum of Solace. They are designed to button up to the top. Folding back the jacket is what originated tailored lapels. Do you think hte pants are charcoal or mid-grey? Flannel? Gabs? It’s difficult to tell anything about the trousers. They are lighter than charcoal, so they could be mid grey. They could also be brown. They could be flannel, or they could be another heavier wool such as cavalry twill or whipcord. Gabardine in unlikely considering the weather. I believe this is the outfit DC wears in the shots with Eva Green by Greg Williams to promote CR. He’s just added the pea coat. Do you have any information about the cardigan that Craig-Bond wears in Casino Royale in the scene when he is searching through Vesper’s phone and finds Mr. white’s number? If so, Bond ir wearing a different shirt underneath the cardigan. That costume card is for the warm-weather outfit during the pre-title sequence, the navy linen suit and end-on-end shirt. I have that card. The photo on the card is wrong. So, what was the brand/designer and why has the Billy Reid Skyfall peacoat become so much more famous than this one ? If something isn’t mentioned in an article, it’s most likely to be unknown. The Billy Reid pea coat is more popular because we know who made it and we can see it well in the film. Hi Matt. Does anybody know how the pockets go on the pea coat. Just difficult to tell? I have not found any stills that show the entire coat. I would assume it has the standard slash pockets.